As the charred embers of Notre Dame Cathedral cool, the internet is abuzz with speculation from the usual speculators as to whether the fire that catastrophically damaged this monument to the height of Christendom was deliberately set. The authorities have been diligent in the execution of their duty, which is to assure everyone that this is a freak accident. They tell us there are no signs of foul play and pin the blame on some kind of mishap vaguely related to ongoing renovations. Skeptics of the official line point out that 875 French churches were vandalized last year alone. Most of us have probably forgotten, but one church attack in 2016 claimed the life of an 85-year-old priest. It bears noting that as of this moment, the powers that be are right. There's no evidence, beyond rampant speculation, that Notre Dame fell prey to arson. Even if it does turn out that the church was burned down by invaders from over the horizon, or secular death cultists feeling their oats, or government stooges intent on replicating the Reichstag Fire, it's all just window dressing. Most of the speculators are already drawing the wrong conclusions. "This is what you get from diversity!" they say. The clear implication is that France's--and the West's--main problem is too many incompatible foreigners eroding their culture. Causally speaking, that theory puts the cart before the horse. Immivasion is the most visible symptom of Western decline. It's not the cause. If the French still had confidence in their culture, they wouldn't be watching their churches burn. What's the real culprit? It's almost a miracle, of the heart-hardening kind, that more people don't see the root of the crisis when it's staring them in the face. The myriad images of the cathedral in flames are crystal clear visual aids. In Scripture and history, the loss of a nation's temple is taken as a sign that God has revoked or suspended that nation's charter. Jesus Himself prophesied the destruction of the Jerusalem Temple. It was fulfilled in AD 70 at the hands of the Romans. That's the other common theme running through these divine chastisements of nations. The transgressors' worst enemy is chosen to carry out the punishment. This extra humiliation helps drive the lesson home. God is the Lord of all nations and the Master of history. You're not putting one over on Him. Another important takeaway is that it's the destruction of temples, not political capitals or economic centers, that sounds a nation's death knell. This makes perfect sense to everyone but late Moderns. A nation's religion is how it explains itself to itself. Culture is what happens when religion intersects with daily life. Temples are sophisticated meme machines precision engineered to apply the power of shared faith to people's lives. Notre Dame Cathedral was the integrated microprocessor of its day. That's the deeper significance of a temple's destruction. Culture without faith is decapitated. It's as hollowed-out as a gutted cathedral. It's a painful experience both watching the toppling of the spire of the cathedral, and trying to come up with the right words in time such as this. As someone who is a Christian but not Catholic, I struggle to say the right things to my fellow earthly children of the Father. I want to express how important the cathedral was as a symbol, and it's place in Christianity, and the western world, but I don't want to come across in the same way as those who Brian rightly rebuked, or those who try to claim the cathedral as a symbol of judeochristianity. The last thing I want to do is come across as disingenuous, or make light of the French Catholics for whom this edifice represents the labor and faith of many generations. I am in no position to appropriate something like this. At very least I can share my grief at such a tragedy, and offer my prayers, such as they are. 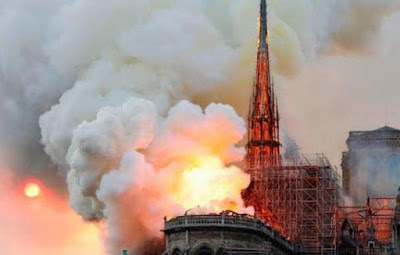 Even with the fire, and the ironic tragedies, I stand at awe at His grace, seeing miracles such as the rescue of the artifacts and art, or the statues not being the spire at the time. I hope things like the videos of the Hymns sung are sign of things to come, and not a epitaph. The sentiment is appreciated, but Our Lady of Paris predates the fracturing of Christian unity in the West. The cathedral is the birthright of any Western Christian, even those of the Reformed tradition. Separated brethren are, after all, still brethren. The Cathedral is not dead, and in fact considering what French officials were saying and what images showed it is remarkable how much of it survived, including the Rose windows. Perhaps this was God's last warning to France. Yes, it is a severe mercy. And divine punishments are also divine gifts. I hope this marks a turn of the West back to Christianity. But the cynical part of me wonders. God spared enough of Notre Dame, it's more than we probably deserve. Gen Z are more religious than Boomers, Xers, and Millennials were at their age, and religiosity tends to increase with age. Much is being made of the "Nones" phenomenon by the secular press, but that kind of pattern isn't historically what we see when religions die--for an example of that, see the current Left. What we see with Western Christianity is a process called "boiling off". That's what happens when nominal members of a religion fall away as times of ease come to an end. This process doesn't destroy a religion. it leaves a solid core of committed believers. We only need twelve, and we'll have millions more than that. That the firemen's chaplinn abbè Fournier saved the precious relics at the risk of his life. People spontaneously kneeling and reciting the Ave Maria. The altar cross shining in the darkness and the rose windows intact. All during Holy week. God still loves us despite being jerks. Let's honour by returning to him like the progidal sons. I wonder if the sight of the vigil singing Ave Maria moved Our Lady to intercede and save the Cathedral. It strikes me as highly plausible. Me too. She's the Queen mother in heaven and no doubt interceded for us. Now we have "architects and historians" wondering if we are putting too much Christian meaning in the building. You'll never hear them ask if too much Islamic meaning is put in the Kaaba Stone or if too much Jewish meaning is put in the Western Wall. The moon rising as the Church burns. France, and by extension, Europe has received her warning. I pray they heed it. Because the chastisement is coming. Our Lady has yet to tell us that her warnings at Quito (Good Success), LaSallette, Fatima and Akita have been turned. I’m sure things will get worse as the West tries Communism 2.0 to soothe its self afflicted secular-Modernist ills and as strong men nationalists hopefuls fail to turn the ship around. The chastisement can't be avoided at this point, but it can always be mitigated.